The File Upload module handles all file uploads for Form Tools. You'll need this module installed if want to upload files through your internal, external and Form Builder forms. 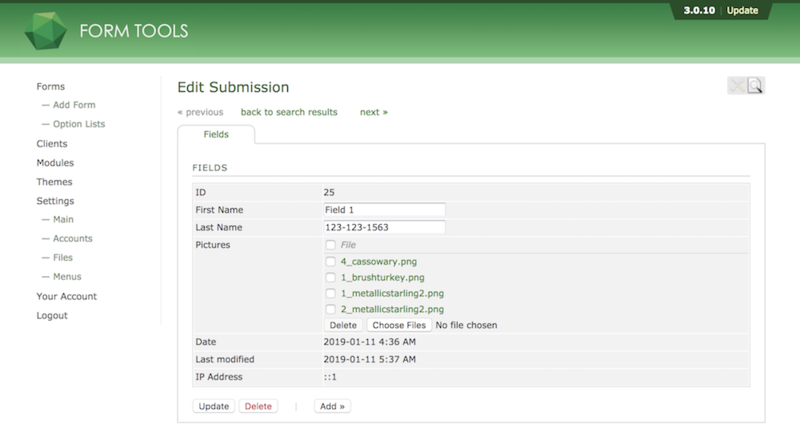 Up until version 2.1.0 of this module, you could only upload a single file per form field. But now you have the option to upload as many files as you want. Because uploading files is such a commonly needed task, this module has come preinstalled on all Form Tools bundles since Form Tools 2.1. But in case you don't have it installed, see the installation instructions here. All modules are installed the same way.